Preheat the oven to 350°F. Slice the bread in half lengthwise. 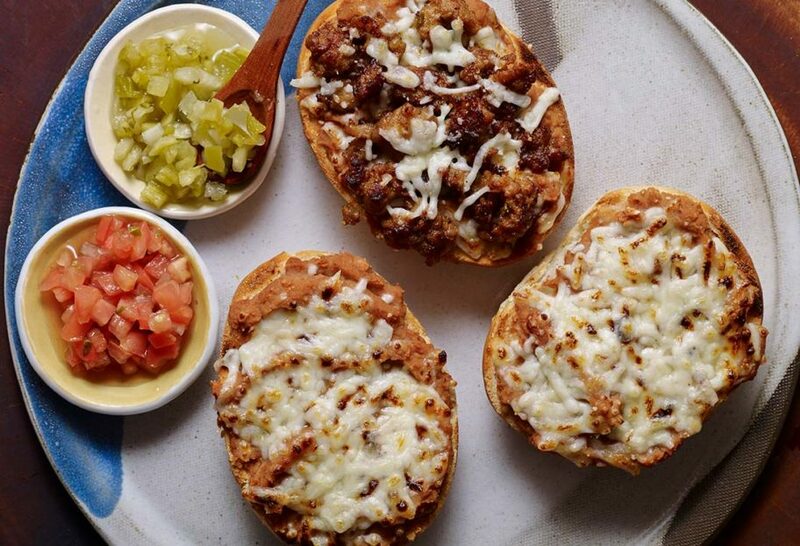 Spread each piece with 3 to 4 tablespoons of refried beans and top with 3 to 4 tablespoons of grated cheese. Arrange the molletes on a baking sheet as you make them. If you want to add more toppings like ham, turkey, bacon or chorizo, sprinkle them on top of the cheese. When they are all assembled, bake until the cheese has melted and the bread has a nice toasted crust on the bottom and around the edges, 8 to 10 minutes. Eat while hot. Serve with pico de gallo, or your favorite salsa, on the side. Thanks for giving the recipes a try, Bill! I made this today for dinner and paired it with a green salad. So delicious! My son Ioved it! Yay! I’m so glad your son and you loved it! Los molletes son de lo mejor! Por pura curiosidad, porque les llamaron “Heroes” en ingles? No entiendo, jaja. I love refried beans. I’m cooking pintos now for refried beans and I’m going to make homemade Bahn mi especially for this recipe. My nearly 4 yr. old doesn’t like refried beans on store-bought flour tortillas, but I think he would really enjoy them this way. Thank you. In Mexico we call this Molletes. Hi Pati, I justed watched the episode with you and your three boys, I can’t wait to cook the recipes especially the mexican cheesecake! All of your boys are handsome, JuJu is a little cutie! I see a future chef in him! I am aTex-Mex Latina, I always watch your show for authentic mexican recipes!! Sus recetas miren tan sabrosas! I will be purchasing your cookbook! Me encanta el programa. Me trae muchos recuerdos de mi estancia en Cuernavaca, México, donde viví por casi dos años. Espero poder cocinar muy bien alún día. I love the program. It brings back a lot of memories of my time in Cuernavaca, Mexico, where I lived for almost two years. I hope to able to cook very well one day. Of course you will and of course you can! Hi Pati, I cannot begin to tell you how much I love your show. I just watched the episode with your three favorite boys and it is by far my most favorite. I can’t wait to make all the dishes in that episode especially the cheesecake. I’ve never had Mexican cheesecake before. Thank you for all the wonderful recipes. Thank you for watching Lesa, and thank you for trying the recipes. Pati, me fascina to programa!! Me gustaria ser tu vecina! 🙂 I do have a question, however. I’m curious about why you translate the names of the dishes to English instead of leaving them with their Spanish names or a reference to both. I love that your introducing so many in the world to our culture. Shouldn’t that include the language when related to the food? Yes! I include their names in Spanish and English, whenever I can. Hola Pati! Thank you for the wonderful recipes. I modified the Alphabet sopa by adding chicken. My family loved it! Your personality really comes through on your show and it’s so very welcoming! Hello Pati, I just wanted to say I’m excited to try your delicious snack. What better place to try it out then Super Bowl Sunday! Thanks again. Your show and food are great. Pati, Buenos dias. I absolutely adore when you cook with your boys, especially JuJu. And the JuJu show is out of this world. We are missing your husband. Will you please cook with him, we would love to see your interaction with him or even the whole family. I can’t wait to make the alphabet soup and the Molletes, my husband loves beans so I will have to make this for him. Keep up the good work, muchas gracias. Hola Tanya, Thank you so much for your comments! Keep watching…I have one with my husband. Thank you for all your recipes. The ABC soup was wonderful. I now have a new favorite soup. Do you have a cookbook? Your wonderful.